How can a rapid drop in cheese prices be a good thing? It will increase the Producer Price Differential (PPD) for the six Federal Orders paying on components. For a basic definition of the PPD, please review the May 12 post to this blog. Class I fluid milk is priced based on the advanced pricing model, which is also influenced primarily by cheese prices, just like the Class III hard cheese milk pricing model. However, the Class I pricing is based on cheese prices about six weeks ahead of the Class III model. When cheese prices are falling, the Class I prices will be higher due to timing and, therefore, the PPD will be more positive. The PPDs for the six Federal Orders paid on components were announced at the start of this week. For the month of May, the prices increased significantly over April prices. The pricing methodology for Class I provides fluid milk processors with a raw material cost that is known before production begins. This is an economic model that few consumer products enjoy. 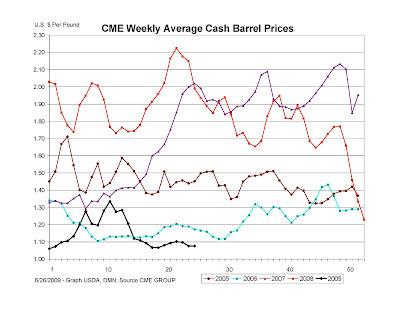 It increases the volatility of milk prices for producers as covered in many of the previous posts to this blog. That said, the PPD model does provide a buffer for the producer. When Class III prices fall, the PPD will increase. When Class III prices increase, it will reduce the PPD and sometimes even create a negative PPD. We all know that a big PPD caused by a drop in cheese prices is only a temporary gain, but in today's environment, any increase in the milk check is welcome - regardless of the cause. Will there be more good signs this Friday? If so, they will posted here early next week. Milk prices in the Federal Milk Orders are primarily dependent on cheese prices. Cheese prices have been near support levels for months and milk prices have suffered as a result. While production and inventories remain high, there are some trends that indicate the situation is starting to change. 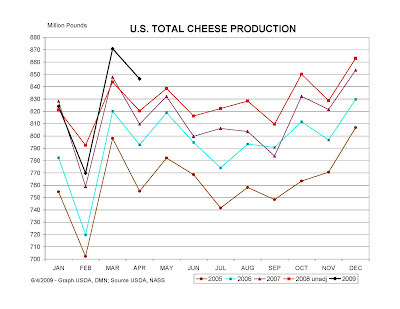 In 2008, cheese exports were abnormally high as a result of the very weak U.S. dollar (USD). Toward the end of 2008, the dollar strengthened and cheese exports returned to more normal levels. 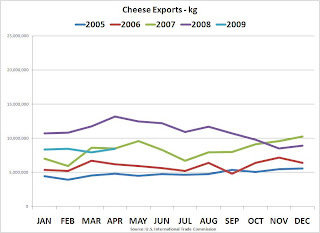 In 2009, the level of cheese exports has remained relatively constant. Exports by country continue to be similar to the historic averages, with Mexico being the largest customer. Exports to Saudi Arabia and Australia have evaporated in 2009. However, in total, export volumes remain stable. 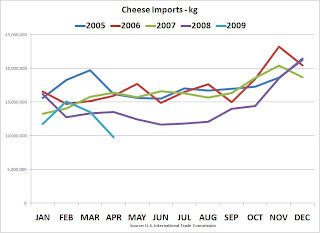 Imports of cheese have, however, hit new five year lows. That is very good because it helps to absorb the excess volume of cheese in the U.S. In a sense, the low imports should not be a surprise with cheese as cheap as it is in the U.S.
Imports of commodity cheese from New Zealand have been very erratic and, at times, extremely high. The month of April was very low and, so far, no data has been posted for May. If May remains low, it could signal a real turning point. Imports of commodity cheese from Australia and Argentina have come off the highs of late 2008. One major factor that made 2008 a really great year was favorable exchange rates. 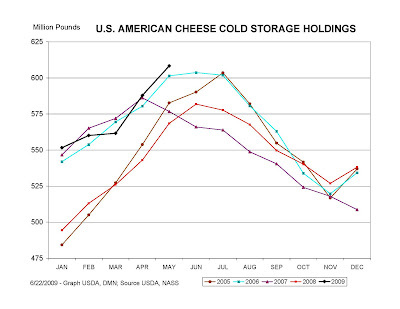 The weak USD made U.S. cheese cheap on the global market. The significant strengthening of the USD in late 2008 and early 2009 had exactly the opposite impact. Finally, the USD (as measured by the USD Index against six other currencies) shows that the USD is weakening. While this can cause a lot of other problems, it is very positive news for cheese exports and cheese prices. The very high deficit spending and potential inflation the U.S. may be facing could further weaken the USD and, thereby improve U.S. cheese demand and prices. Of particular interest is the New Zealand Dollar compared to the USD. As explored in a previous post to this blog, New Zealand is the global competition. The New Zealand dollar continues to strengthen vs. the USD. As of this date, the change is quite significant and shows recovery halfway to the mid 2008 levels. A continuance of this trend, could have a significant impact on the health of the U.S. dairy industry. Positive signs of recovery are starting to appear. These signs will be monitored closely in upcoming posts to this blog. May Class III prices were announced rather early today. It was not good news. As predicted in an earlier post to this blog, prices dropped significantly. To be fair, there were some increases vs. April, 2009. 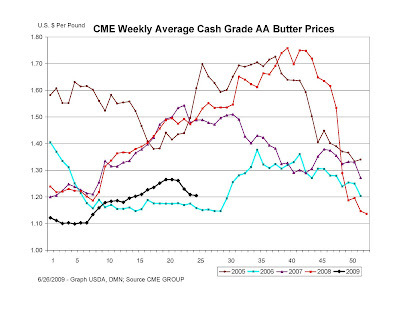 Butterfat increased from $1.20 to $1.26/lb. and other solids finally went positive, increasing from from a -$.004 to $.003/lb. However, the numbers that really count hit major lows. Protein dropped to $1.75/lb, the lowest level since April, 2001 - over eight years ago! The Class III milk price was announced at $9.84, the lowest (with the exception of February, 2009) in six years. These prices have also changed the pie chart of the milk check which is typically published with the price announcements. For the first time since these were published, protein made up only 50% of the milk check. Protein is still very important, making up half of the milk check, but this is a new low in the recent statistics. The Chicago Mercantile Exchange (CME) weekly prices will be updated this Friday afternoon after the Friday trading period closes. Based on the trading numbers so far this week, there is not much change expected. Is there light at the end of the tunnel? Nothing has significantly changed in the basic economic data. The Central Federal Order (FO) #32 is the fourth largest FO. As stated in an earlier post, all six of the orders paying on components are being reviewed separately as they are all very different. The three larger ones have been reviewed in previous blogs. The Central Order is really the norm of the six orders. The Central FO is balanced between classes of milk in a pretty typical way, with a fairly even split between Class I & III milk and smaller pieces of the pie for Classes II and IV. The Producer Price Differential (PPD) has rather average spikes, higher than the Upper Midwest that is exceptionally strong in cheese production and less than the Northeast order that is exceptionally strong in fluid milk. When the price of cheese escalates rapidly and the PPD become negative, those that can, depool from the order to avoid the pay deduction caused by the negative PPD. This increases the burden for those who cannot depool. At the root of the depooling issue is the six weeks timing difference between the pricing of Class I and Class III milk. While this is financially convenient for the Class I processors, it results in a price volatility for producers that should not exist. So what makes FO #32 different? The significant lose of Class III milk going to cheese. This lose of Class III milk shows up in both the trend charts below and the overall milk by class chart above - 2006 was a major shift. Friday's post will review the May component prices and the Class III milk price. The May 30 post predicted some pretty low prices for May. Unfortunately, not much has changed to improve this prediction.